Singer/songwriter Demi Lovato has been an outspoken advocate for mental health since being diagnosed and treated for bipolar disorder. “Getting a diagnosis was kind of a relief. It helped me start to make sense of the harmful things I was doing to cope with what I was experiencing,” Demi said. 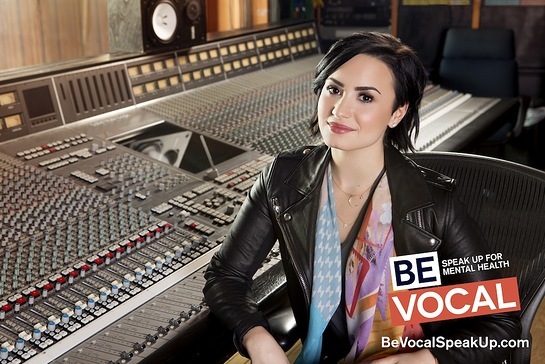 And now, the young star has teamed with several leading mental health advocacy groups to encourage people across America to “Be Vocal” and use their voice in support of mental health. Be Vocal: Speak Up for Mental Health is an initiative that aims to empower adults living with mental health conditions to speak up when talking with their professional support team and to speak up as a community to advance mental health in America. The initiative is a partnership between Depression and Bipolar Support Alliance, The JED Foundation, Mental Health America, the National Alliance on Mental Illness, the National Council for Behavioral Health, and Sunovion Pharmaceuticals Inc. This is the first time these organizations have come together to support an initiative focused on helping individuals and communities advocate for themselves and others. Be Vocal evolved out of The Mental Health Listening & Engagement Tour supported by Sunovion in 2014. During the Tour, Demi had the opportunity to learn from our country’s top mental health advocates about the power of advocacy – why it is important to advocate for yourself and others and how to use her voice to help her community. 1 — It is important to be vocal—not only for yourself but also for your community. 2 — There are many things that each and every one of us can do to make a difference. 3 — We need to treat mental health conditions with the same attention and care as any medical condition. The brain is an organ, too. 4 — Living, loving and being well with mental health conditions is possible. 5 — She’s not alone. Approximately 44 million adults – 1 in 5 Americans – of every race, gender, religion and socio-economic status is diagnosed with a mental health condition in any given year. Bringing everyone together to encourage open conversation about mental health is one of the main ways we can combat stigma. We applaud Demi for leading these efforts and building new partnerships around collaboration and a shared mission. To learn more, visit BeVocalSpeakUp.com.